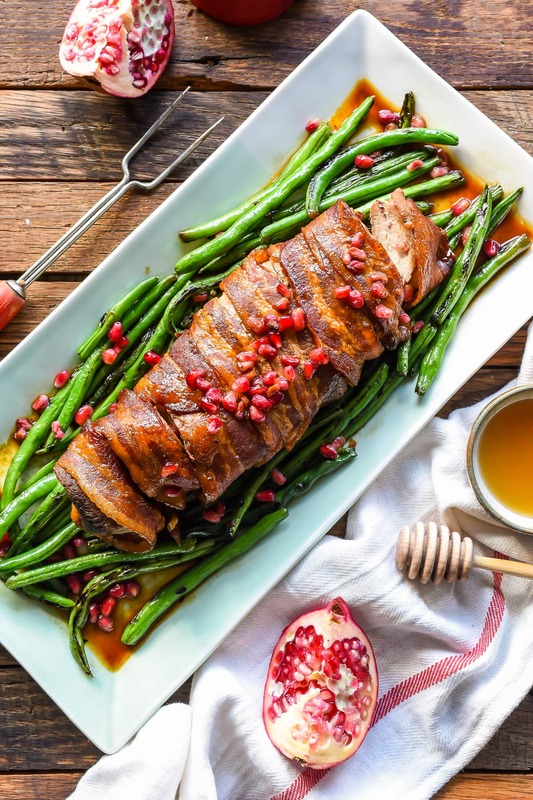 This Bacon Wrapped Pork Tenderloin is topped with an easy pomegranate honey glaze for a show stopping meal that’s deceptively easy to make. This time of year I find myself vacillating between two different extremes. On one hand, I want to do ALL THE CHRISTMAS THINGS. I want to visit light displays, take pictures with Santa, buy boutique wrapping paper, decorate every last inch of our house, and DIY meaningful gifts for all my family members. On other days, I want to curl up with a blanket and some hot cocoa in my messy, halfway-decorated house and just. do. nothing. Does anyone else start feeling the pressure in December? Pressure to do more, spend more, create more, bake more. I fill up my schedule with activities in the hopes of packing the season with memories, but instead find myself tired and distracted. What I really want more than that Instagram worthy tablescapes or that darling photo of my kid gazing at the Christmas tree (really, whose kid stays still long enough for this to happen???) is to be present with my family. I want time. Focused time. Time where I can give all of myself and my energy to the people I care about most. Time where we can be spontaneous. Time where we can go look at Christmas lights, or we can sit at home in our pjs and watch a movie. I want to remove the pressure from my back, and replace it with joy. Part of removing the pressure involves adjusting my expectations for holiday meals. I love serving a magazine worthy spread as much as the next girl, but you know what I don’t love? The stress and hustle and stacks of dishes that go along with it. So I look for meals that are beautiful and simple–something that feels special without being overwhelming. 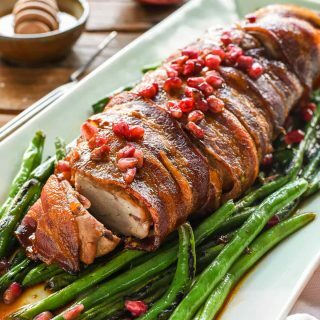 One of those meals is this bacon wrapped pork tenderloin. Here we’ve got six ingredients (that’s including the salt and pepper!) for a show stopping main course. 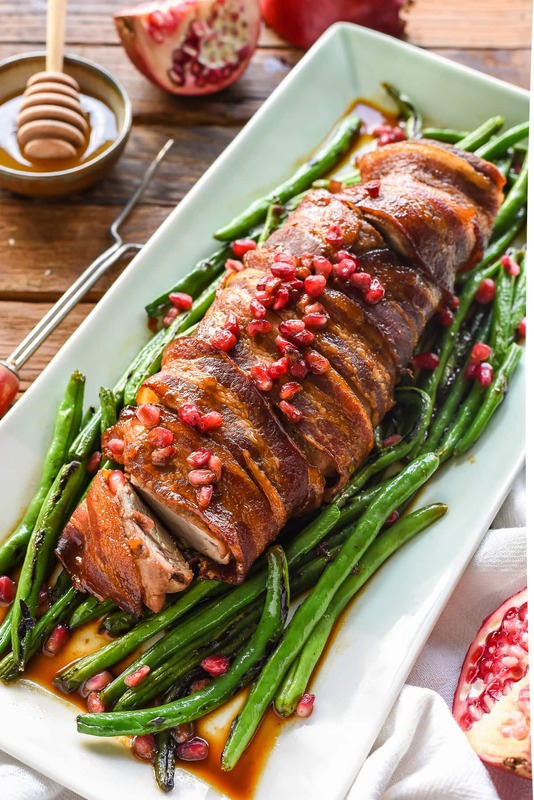 The salt and peppered pork is browned on the stove top and wrapped in bacon before being drenched in a simple honey pomegranate glaze. The pork bakes up in only 25 minutes and stays nice and juicy thanks to the bacon. We can thank the honey for giving it that irresistible golden brown sheen, and the generous sprinkling of pomegranate seeds for making this dish look downright festive. Honey is my go-to when I want to dress up something ordinary for the holidays. It’s awesome drizzled on biscuits, you can use it as a dipping sauce for goat cheese stuffed dates, it’s even fabulous on sautéed green beans! That kiss of sweetness is the perfect compliment to savory or smoky foods. I especially enjoy it with bacon and pork. It’s such a lovely contrast! To help ease the stress of the season, I’ve teamed up with a few blogger friends to bring you a stunning honey-inspired holiday menu that keeps things simple without sacrificing flavor. We’ve even got a grocery list (click here to view and print!) for you, so you can head straight to the store to grab everything you need. Be sure to check out the other recipes on the menu, or for even more ideas on how to incorporate this versatile ingredient into your holiday cooking, be sure to visit honey.com. Set aside 2 Tablespoons of the pomegranate juice. Combine the remaining pomegranate juice and honey in a small pot. Bring the mixture to a boil over medium high heat, stirring often. Reduce heat to medium and continue to cook, stirring occasionally, until the mixture is reduced by half, about 7-10 minutes. Remove from heat and allow the glaze to cool and thicken while you prepare the remaining ingredients. Generously sprinkle the pork tenderloin with salt and pepper. 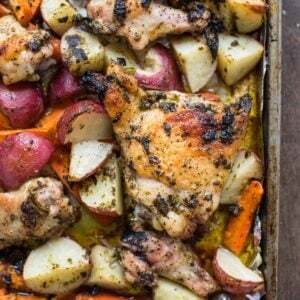 In a large oven proof skillet, heat the oil over medium heat. Place the pork in the skillet and brown on all sides. Remove to a cutting board. Use the 2 Tablespoons pomegranate juice to deglaze the pan, scraping up any brown bits on the bottom, then remove the pan from heat. Wrap the bacon slices around the pork, overlapping them so the ends stay secure. Place the pork tenderloin back in the skillet. Pour the glaze over the pork, using a brush to make sure it's thoroughly covered. Place the pork in the oven and roast uncovered, scooping up and brushing the pork with the juices from the pan every 10 minutes. Roast for 25-30 minutes, or until a thermometer reads 145 degrees. Remove the pork from the oven and glaze again. 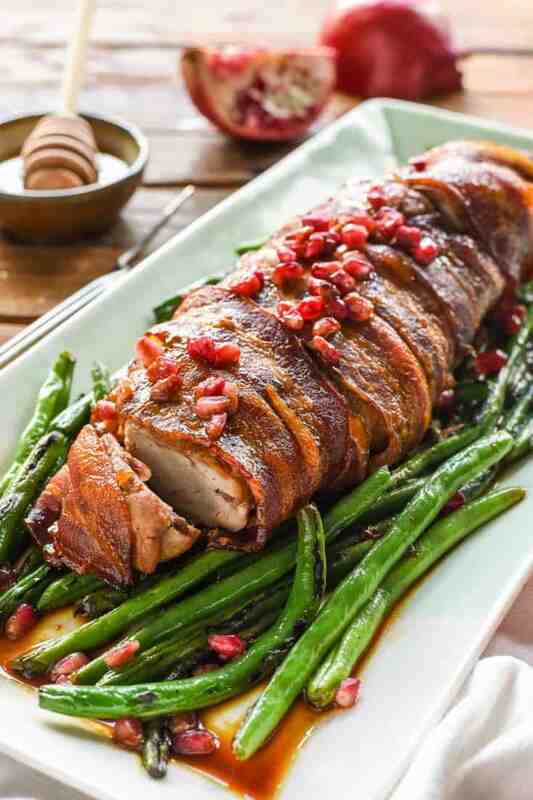 Allow to rest for 5 minutes then glaze a final time, sprinkle with pomegranate seeds, and serve. 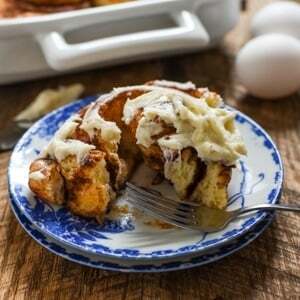 The glaze left in the pan goes great with blistered or roasted green beans! This recipe is sponsored by the National Honey Board. As always, all opinions are my own. I would probably just leave them out and glaze the pork with plain honey. It will still be delicious!